Just because a sprint is the shortest racing distance in the sport of triathlon, doesn’t mean it’s easy. However, if you followed XRCEL-sponsored athlete Brian Norling’s results, you would see that he makes winning at any distance seem simple. The Point Pleasant, New Jersey native continued his streak of standing atop the podium as he claimed his first New Jersey State Sprint Triathlon Champion title after beating a talented field of racers, some half his age. Check out how Norling uses XRCEL to stay fully-fueled and reign supreme throughout a tough triathlon season. 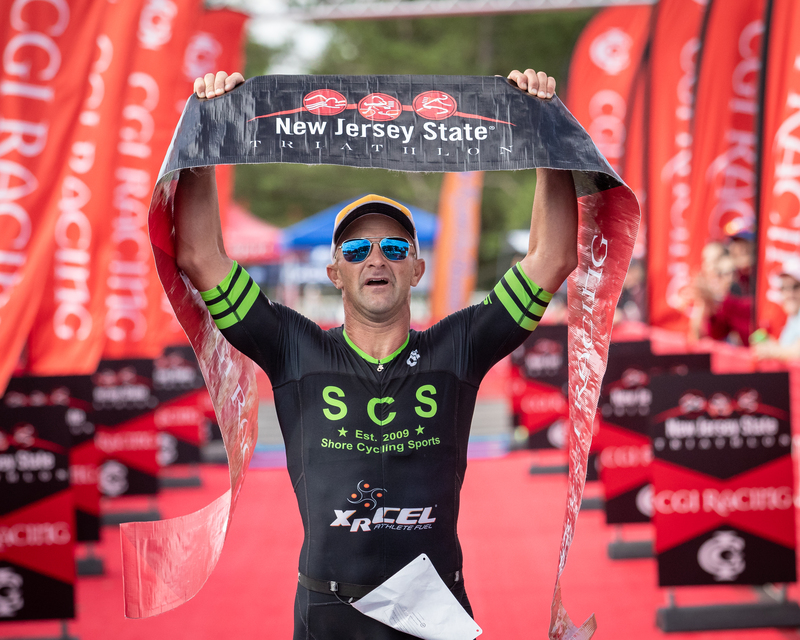 XRCEL: What initially attracted you to racing the New Jersey State Triathlon Championships? Brian Norling: Since I started racing triathlons, the NJ State Triathlon has been one race I’ve done almost every year starting back in 2009. I’ve only missed it when the race conflicted with other races. It is one of the largest race in the area and gets great racers from all over the area, which makes for great racing. You have to always come into the race in great race shape because the race is very fast right from the start. I used to race the Olympic distance here, but the last two years, I have raced the sprint distance. How did placing 3rd overall in 2017 fuel your training and focus for returning to race in 2018? Placing 3rd last year was a great feeling, but it also gave me the drive to try to win the race this season. I knew I had to be faster at 43 years old than I was at 42, which was not so easy. I had to look at what I did in 2017 and find where I could make up some time. The months leading up to the race I did a few more sprint triathlons than I normally would, which gave me the chance to work on the race as a whole and see what I needed to change. In sprint races, every second counts, so I knew I couldn’t have any race hiccups if I wanted to come out on top. At 43 years old, you were competing against guys nearly half your age and still won. How has fueling with XRCEL in your training and racing these past few years elevated your overall performance and allowed you to beat some very fast, and younger, opponents? I use XRCEL in all of my training sessions, which gives me the edge because I don’t have to worry about how I’m going to feel during the race. I know that I’m not going to have any cramping or stomach issue when I use XRCEL, so it’s one less thing to worry about during the race. XRCEL gives me the fuel I need to race to the best of my ability. What do you see as the biggest difference in using XRCEL when training and racing compared to the products you have used in the past? XRCEL is easy to use as I can easily fit the easy-to-grip bottle in my jersey pocket when I train and race. You can drink half of a bottle and put the cap back on without a problem. There is no ease like that with a gel. Also, the amount of nutrition is always the same, so I don’t have to worry about measuring and mixing of a powder to make a drink. Once you realized you were the overall winner of the sprint race, what emotions did you feel? It was a tough race for me. I went from thinking the race was over for me to “wow, I won!” in under an hour. I didn’t have a good swim at all, coming out of the water two minutes down from the leader, which is not where I wanted to be. I had to put in a great bike leg and run to make up time and I ended up with the fastest bike split of the day and a top five run time. Coming down the finishing chute and raising the tape was a surreal feeling. The energy was so high and I was so stoked to win the overall race and become the NJ State Sprint Champion. It was such an awesome feeling! How do you use XRCEL in shorter, faster triathlon races like the NJ Tri Championships? In a short race like NJ State, I drink one bottle of XRCEL, followed by some water, about 15-20 minutes before the race starts. I’ll also have one bottle of XRCEL on the bike and drink about half of it with a few miles left in the bike portion. This strategy helps me stay fueled up for the entire run. With consistent success and wins in your races, who inspires and drives you to continue to push yourself at such a high level? My kids and family are my inspiration to keep going. I like that the training and racing is teaching my kids a healthy lifestyle. Now that both of them are getting older, I do some training with them as they are both into sports. Getting a couple runs in with them is the best time. I try to do most of my training early in the morning so I don’t take away from the family time. I have to keep an open mind about my training schedule because with family and running a business, things can change at any time. I do believe in quality workouts, which is why I make them all count. What are your racing goals for the rest of the year? I have a few more triathlons on the schedule for the year. Ironman 70.3 Atlantic City in September and another late season sprint in my hometown. After that, I will do a few fun cross country races and a six-hour mountain bike race to end the season in November.